Our latest review for Hasbro is the Beyblade Burst Epic Rivals 2-Player Starter Set with Beystadium. It's the first time my young boys have played properly with their older brother's Beyblades and now they understand entirely what it's about. 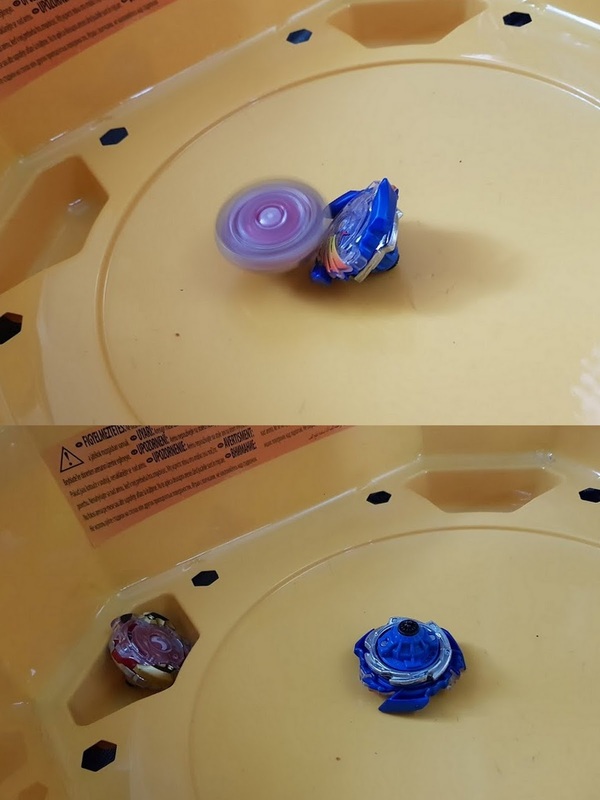 Beyblades were very popular in our house when they first arrived in the UK in 2002. They've taken a back seat for a while and now they're back - stronger and faster than before. 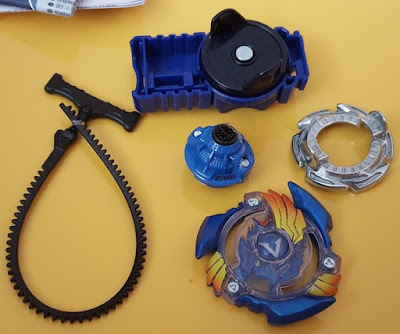 Inside the box you have the Beystadium, 2 Beyblade Burst Tops and 2 Beyblade Burst Launchers. There really is minimal packaging here, just some sealed plastic bags, and it's opened and ready to play in seconds - Christmas morning-friendly. 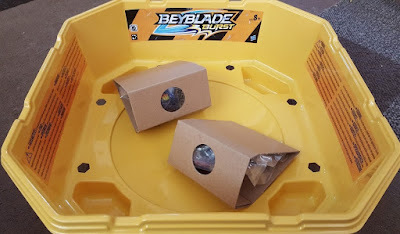 The Beystadium is huge as you'd expect - measuring a healthy 40cm approx and your Beyblades use it all. 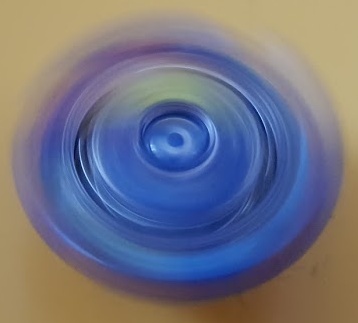 At each corner is a pit for victims, or parts of victims, to fall into, these are exploding 'Burst' Beyblades after all. There are also hexagonal holes which you don't usually get caught up in, but when you do there's no escape. 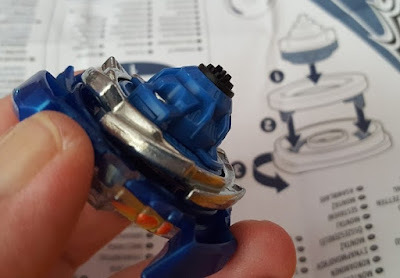 Each Beyblade is made up from 3 clip/slot together pieces and powered by attaching it to the launcher and pulling the rip cord. 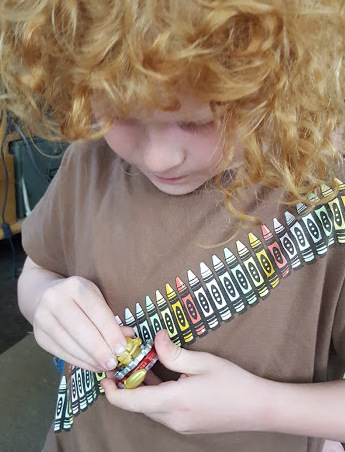 It doesn't take any time to learn,. but you can always improve and become quicker to launch and more precise with your landing. When you crash, you smash - at least that's the theory. 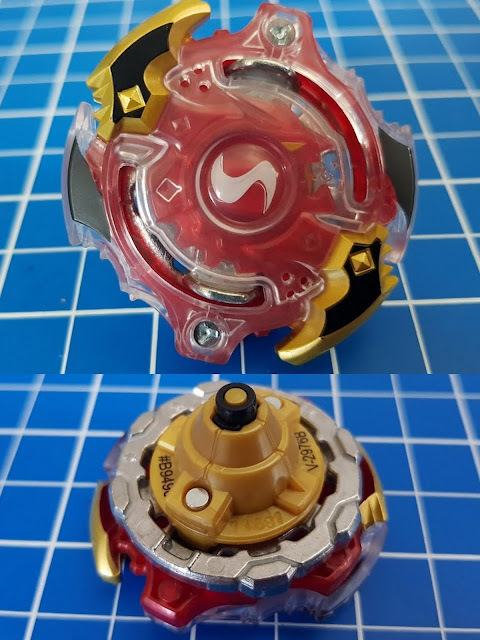 The Beyblades actually work very well and don't usually burst apart at the first hit, so it isn't frustrating - you can have a proper battle. They're easy to reassemble once you've had practise. These are really attractive toys. The Beyblade Burst spinners are beautiful to look at, heavy and tactile. 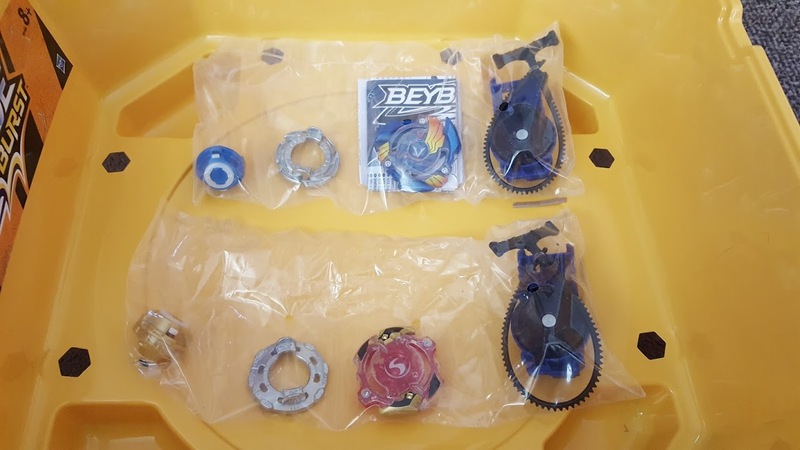 We've many different Beyblades from over the years and none are so classic and elegant as these. The new bases give much better frictionless turning and balance too. 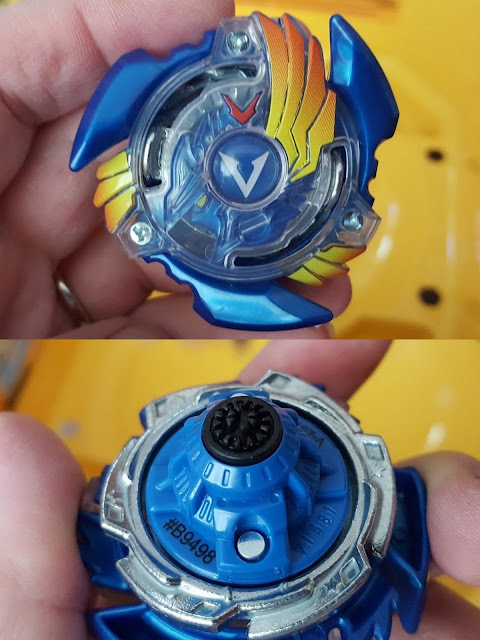 The launchers are slightly bigger than previously and these are heavy Beyblades with a really nice feel to them. In the stadium, it's all action and noise and very competitive - especially when the big kids and grown ups get involved! tragic when you win a battle and then bounce yourself into the pit though. That's short-lived glory!. Beyblade Burst start at around £12.99. The Beystadium makes Beyblades into a proper game and the quality of the Beyblades is such that these do feel like fair value for your money. 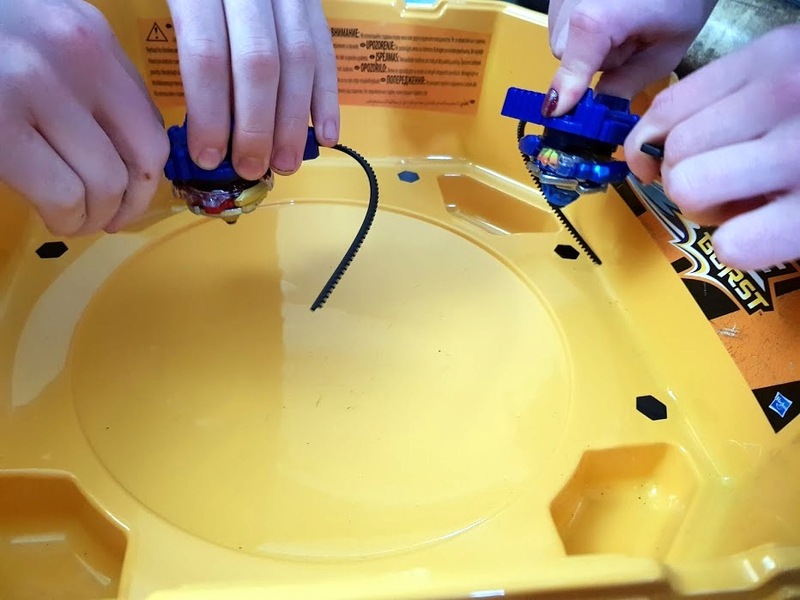 Check out the Hasbro Beyblade website for news and information about Beyblades - including how to upgrade and make the most of your battlers. You can also scan the Beyblade top with your device and unleash your own Beyblades in the Beyblade Burst App. 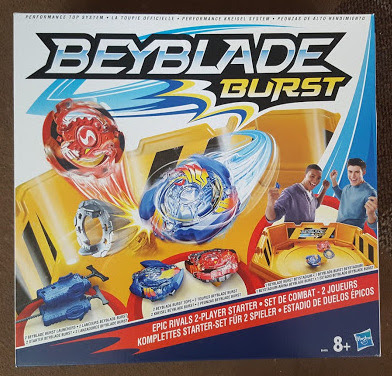 Beyblade Burst Epic Rivals Starter Set (age 8+) is distributed by Hasbro and has an rrp of £39.99. 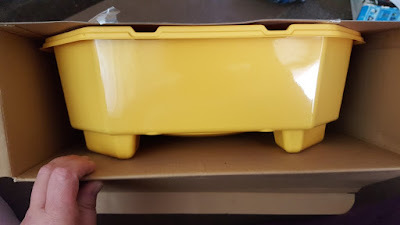 Available now from Toy Shops including Smyths and Toys R Us. 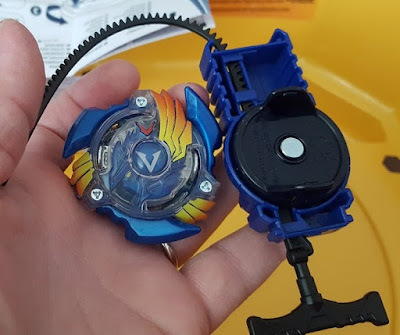 We were sent our Beyblade Burst Epic Battle Set for review.